Mineração Rio do Norte (MRN) is Brazil's largest producer of Bauxite, the raw material for aluminum. In 2017, the mine delivered a total of 16.3 million tons of material. The bauxite is extracted at the mine in Porto Trombetas (PA), where it is processed and then transported by rail for 28 km to the port on the banks of the River Trombetas, at the western extreme of Pará. Every aspect in the production and shipping process counts when it comes to ensuring the mine's production arrives at the port as scheduled. In 2017, a critical ore reclaimer used for moving the production within the company's yard was in need of service. The machine, weighing 300 tons, had to be repaired in under 14 days, which posed a major challenge. The solution? Engineering and planning. "The problem involved the pins of the counterbalance, a sort of arm of the ore reclaimer, which had forced the machinery to operate with limitations for more than a year," relates Willison Jean Silva Marinho, Manager of the Department of Mechanical and Industrial Maintenance at MRN. Since detection of the problem, the company had been monitoring the reclaimer for safety reasons and had established that the intervention should be carried out in the first half of 2018. During the planned downtime, the mining company would use an alternative loading system; but its use could not be extended for very long without significantly impacting production. If the maintenance went over the time allotted, production shortfalls could result, so rapid action was required. "Our initial plan involved a nine-day stoppage that could be extended to 14 days," Marinho explains. "When we dismantled the counterbalance and noticed that other repairs needed to be done, there was action taken on the part of Metso, including relocating other professionals from Sorocaba (SP) to Porto Trombetas (PA) which kept us on schedule," he adds. Diego Polaz Mateus, Maintenance Engineer of the Services area of Metso, was directly involved in the repair of the reclaimer and points to the safety of the process as critical "It is high-risk maintenance. If badly planned, it could put the lives of the professionals, the equipment and the production of MRN at risk," he highlights. According to him, the scope of the repair included the substitution of the pins of the main articulations, the lower pins of the mast, and the tilting cylinders of the reclaimer. "The rapid action in relation to the on-site circumstances guaranteed the success of the procedure and compliance with the schedule," he concludes. Marinho also emphasizes that the partnership between MRN and Metso is fundamental for the company. It allows them to consult Metso if maintenance is required on any of their other three reclaimers, two of which are located in the processing plant and one at the port (for shipping). 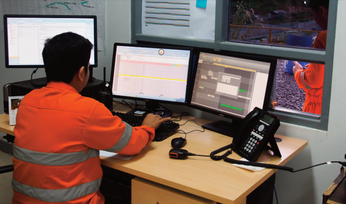 Danilo Caserta and Augusto Alves, Product Support Engineers at Metso Brazil, were involved on two critical work fronts. The first was to work with vendors quickly to obtain the parts needed for the field intervention. In parallel it was necessary to work on the component replacement procedures along with structural and mechanical engineering, in order to ensure the integrity of the equipment and the people involved in the parts replacement. "The crucial step in this process was the technical definition of the solution needed to solve the problem. We acted quickly and in an integrated manner to identify the problem, its cause, operational impacts and a better alternative solution. It was necessary to act quickly to identify necessary parts to be replaced, seeking for the shortest possible lead time to reestablish the safe operation of the equipment involved. "Concludes Danilo and Augusto. To perform the actual repair - changing the counterbalance pins - MRN first consulted with several companies. One of the options suggested was to cut the parts of the counterbalance, perform the procedure apart from the equipment, and then weld them back together afterwards. However, following the recommendation from Metso, the mining company opted to move the reclaimer without cutting the counterbalance. The operation to move the reclaimer involved two high-capacity cranes: the first 160-ton crane was used to hold the part. The smaller 75-ton crane did the moving of the pins, precisely where the problem was, and other components. The execution of this repair required specific initiatives, such as the careful removal of the machine's counterweights, preventing them from breaking. Metso was asked to assist MRN in the development of the design and technical support for the fabrication of two metal structures - one that was 12 meters in height and weighing approximately 12 tons and the other 9 meters in height and weighing approximately 9 tons. The structures were to be used to support the crane operator's boom during the execution of the services. The same type of support was provided for the fabrication of the device used in place of the tipping cylinder during maintenance. "We opted for the procedure recommended by the manufacturer of the reclaimer, Metso, both because of the movement of the counterbalance as well as the specification of the materials," explained Marinho. "MRN and Metso devised a plan to hoist the counterbalance - the inadequate movement of which could put the entire machine at risk. During the repair itself, the manufacturer's expertise allowed additional parts to also be repaired or replaced, as was the case with the pin flange. We did the work as a team, with active participation from the local Metso engineering teams, as well as support from their branch in the United States," concludes the specialist at MRN. 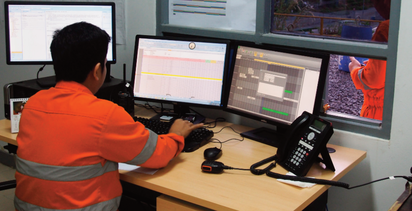 The teamwork that Marinho mentions was comprised of Metso's product support, engineering, and field execution teams. Due to the great complexity involved and the need to collect information at the customer's premises, the planning process was finalized in a little more than a month. In all, eight specialized professionals worked directly on the project, along with the MRN specialists. The repair execution was validated by a 24-hour operation test. To provide an idea of the project's final overall complexity, the operation consumed over 264 hours and involved a team of 26 employees working in two 12-hour shifts. The execution phase of the repair itself consumed nine of the planned 14 days, the period between mobilization and total demobilization. Metso has been an active participant in MRN's operations since the supply of equipment in the early stages of the mine's development. Currently, the partnership has been strengthened with the addition of services, including parts and technical assistance, with an emphasis on engineering solutions involving a high degree of technical knowledge. The scope of the partnership has been extended to cover new areas, such as the supply of gears for the mine's port dryers as well as additional parts, services and engineering support for the equipment. In the specific case of the repair of the reclaimer, this is the first type of service of this kind carried out by Metso in Brazil and a milestone, due to the high complexity and the associated risk. "We highlight the customer satisfaction resulting from the intervention, which reinforced technical capacity as a determining factor in the partnership," concludes Mateus. Brazil's largest producer of bauxite, the raw material for aluminum, MRN is formed by an association of national and foreign companies operating in the Amazon region of western Pará state since 1979. The mining company is considered one of the best companies to work for in the Amazon and has more than 1,400 direct employees, 88% of them from the Northern region of Brazil (data from 2017).